If we want people to make carefully-considered moral choices, and if we want them to spot unethical behavior in others, then sleep needs to be a priority. Most people think they are ethical. But ethical transgressions happen frequently. Researchers ask the question of why this occurs and pursue scientific inquiries designed to provide answers. One line of inquiry focuses on moral awareness. My colleague Scott Reynolds, a prolific ethics researcher here at the University of Washington, defines moral awareness as a person's determination that a situation contains moral content and legitimately can be considered from a moral point of view. Research indicates that without moral awareness, people are unlikely to effectively engage in moral judgment or accurately judge the morality of others. In other words, without awareness that there is a moral component to a given decision or action, people will proceed without engaging in a thorough and purposeful decision process about that morality. And without moral awareness, people will not recognize unethical behaviors engaged by other people as unethical. Recent research indicates that moral awareness is dynamic over time, such that the same individual can be high in moral awareness at one point in time and low at another point in time. Part of this is based on how much energy and self-control the individual has at a given moment. My colleagues (Brian Gunia, assistant professor of management at Johns Hopkins University, and David Wagner, assistant professor of management at the University of Oregon) and I built from these findings to ask the following question: Does a lack of sleep hinder moral awareness? We started from the idea that moral awareness involves directing attention to the moral components of a given decision or behavior. Specifically, in order to bring a moral issue into conscious awareness, people must go through an effortful process of directing attention to the issue. But previous research indicates that a lack of sleep makes it more difficult to direct and maintain attentional processes. Thus, we hypothesized that a lack of sleep would lead to low levels of moral awareness. To test this hypothesis, we conducted three empirical studies. First, we conducted a laboratory study in which we randomly assigned participants to a control group (mean of 6.43 hours of sleep) and a group in which participants were partially sleep deprived (mean of 4.35 hours of sleep). Then all participants read a scenario which involved an ethical violation, and were asked to complete a measure of their moral awareness (e.g., "This situation could be described as a moral issue"). Consistent with our hypothesis, sleep deprived participants scored lower in moral awareness than the control group. We conducted a follow-up study in which we followed a different group of participants over multiple days, this time focusing on naturally occurring variance in their sleep. In this study, each person participated on 4 separate days. On each day, participants indicated how much they slept the night before, read one of 4 ethical scenarios, and then completed the same measure of moral awareness as the first study. Consistent with our hypothesis, when a given individual was low in sleep, moral awareness suffered, and when that same individual had a full night of sleep, moral awareness was high. We conducted a third study designed to capitalize on the sleep loss produced by the Spring change to daylight saving time. Previous research indicates that on the Monday immediately following the change to daylight saving time, people get around 40 minutes less sleep than they otherwise would. 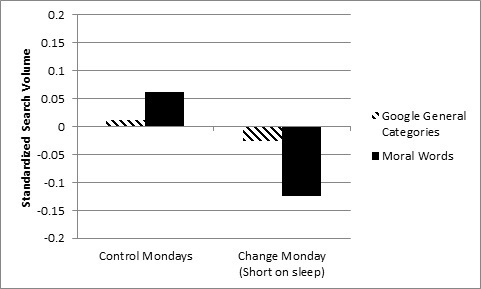 So we compared moral awareness on that Monday (which we call "Sleepy Monday") with the Mondays immediately before and after. However, in contrast to the first two studies, we used a different measure of moral awareness. Based on the idea that internet searches reflect what people are thinking about, we used Google Trends to track internet search behavior. We generated a list of words associated with morality, and then examined the frequency of searches of this list across the three Mondays of interest. We also did the same for Google's general search categories, in order to see if any changes across the Mondays were associated with changes in general search behavior rather than that specifically focused on morality. We found that there was a dip on Sleepy Monday in searches including terms from our morality list, but no such corresponding dip in the Google general search categories. This was consistent with our expectation that Sleepy Monday would be characterized by lower moral awareness (as operationalized by internet searches). Although there are limitations to each of these three studies, the consistency in the findings across the different methods should lend confidence to the idea that a lack of sleep does indeed erode moral awareness. This is important because moral awareness is a driver not only of one's own morality, but also in how people evaluate the morality of others. If we want people to make carefully considered moral choices, and if we want them to spot unethical behavior in others, then sleep needs to be a priority. Thus, a lack of sleep not only influences unethical behavior, but also in how we process information about morality as well. For more information about this research, see our forthcoming article in the Journal of Sleep Research.